While Iceland may resemble another planet at times, with its geothermic activity and volcanic backdrop, it's actually not terribly far from our home in New York, just over five hours by plane. We decided to visit the capital city of Reykjavik over an extra-long holiday weekend in September to check out this lovely city and its varied surroundings. Most visitors to Iceland use Reykjavik as a home base for branching out to the rest of the country's popular sites, including the famous Golden Circle. Booking guided tours to get around, as we did, is quite common, although you could easily rent a car and drive yourself. Just remember that the distances between attractions can be hours long. Much of Iceland reminds me of Yellowstone National Park. There are geysers, geothermal pools, waterfalls, and alien looking landscapes everywhere. Driving from one sight to the next, you might pass bucolic pastures dotted with fluffy sheep and miniature horses, then towering mountains straight out of Lord of the Rings flanked by low-hanging clouds, followed by fields of black lava rock that look like they belong on another planet, with glacial rivers flowing through. The topographic variances are mind-boggling and make for a family trip like no other! Our hotel in Reykjavik was a real find. We stayed at the Kvosin Downtown Hotel at the city center, and our room felt like a spacious and well-appointed studio apartment rather than a hotel room. It came complete with a small kitchen, bedroom area, living area with foldout couch, and large bathroom, and best of all, was decorated in a Scandinavian chic style, sort of like an upscale Ikea showroom. My whole family absolutely adored staying at the Kvosin. By the way, Saturdays are nammi dagur, or "candy day" in Iceland, and we happened to check in on a Saturday. Our hotel had a candy buffet in the lobby, and our kids were immediately sold on Iceland after filling up their bags with free gummies, chocolates and licorice. The first thing we did after landing in Reykjavik was go to the Blue Lagoon, arguably the world's most famous hot springs. It was literally our first stop — we went straight from the airport, which is a common way to visit the Blue Lagoon, as it's located right nearby. Many tourists will stop by to get in a soak either before or after their plane ride. If you visit just one geothermal spa in Iceland (and there are many to choose from), make it the Blue Lagoon. I worried about it being too commercial, but it was truly impressive, yet still relaxing. It's an experience that you literally can't find anywhere else. Book your entry in advance, as they do limit the number of visitors per day. The lagoon is like a hot tub the size of a small lake, stretching on and on between an otherworldly black lava field covered in green moss. The water is an ethereal pale blue from the silica and 102 degrees Fahrenheit, which is perfect when it's only 50 degrees outside and drizzling, as it was on the day we visited in late summer. We enjoyed getting free facials from the mud mask station and drinking from the cold Icelandic water fountain, both located right inside the pool. You get a free beverage with your entry as well, but we didn't think we could manage the cups and our kids, who had to wear water wings (provided free of charge) because the depth of the water was over their heads in parts of the bath. I was seriously impressed by how clean the Blue Lagoon was. I usually get a bit skeeved out at swimming pools and spas because the chlorine smells are so strong. But at the Blue Lagoon there are no smells, and everything from the changing rooms to the lagoon itself is unbelievably clean. We visited another geothermal spa in Iceland called Fontana, in the town of Laugarvatn. It is not nearly as impressive in size, and more resembles a classic bathhouse, with a handful of hot tubs in varying sizes and temperatures, as well as some saunas and steam rooms. The big draw of this place, however, is the rye bread-making demonstration, which happens every afternoon. Basically, the staff buries a pot of dough each day for slow-baking in the heat of the underground hot springs, and digs up the previous day's bread for visitors to sample. The bread was unearthed before our eyes, then brought back to the restaurant to be sliced up in front of everyone and enjoyed with butter. I am not a big fan of rye, but man, was this bread fresh and delicious! Aside from the hot springs, we really liked the town of Reykjavik itself. There are plenty of cute restaurants and shops clustered together everywhere, and many things are within walking distance of the city center. We walked to all the restaurants we ate at, and poked around in shops selling everything from puffin mugs to reindeer rugs. One caveat: Everything is majorly expensive in Reykjavik, literally double or triple what you think it should cost. My kids usually pick up a stuffed animal as a souvenir for less than $10 from the places we visit, but in Iceland a medium-size stuffed puffin is $30. Thirty dollars! We bought an $8 bag of volcanic rocks instead. A great place to visit in town is Hallgrímskirkja Church, with its formidable exterior and enormous pipe organ on the inside. The tallest building in Reykjavik, it also serves as an observation tower, where you can get panoramic views of the town. Visiting the church is free, but you have to buy tickets to take the elevator to the eighth floor, then walk up four more flights of stairs to the top. The breathtaking view is worth it. There were a few things that we wanted to see and do in Iceland, but weren’t able to. The first was the elusive Northern Lights. We took a tour bus to a dark field about an hour outside the city with the hopes of spotting the Aurora Borealis, but unfortunately it ended up being too cloudy. That was really disappointing! If you’re planning on doing this with kids, make sure they take a nap in the middle of the day (we didn’t get back till after 1 in the morning) and that they’re aware they might just end up staring at a dark sky for an hour. We waited on the warm bus for most of the time. If the lights do appear, however, I’m sure it makes for lasting memories! I also wished we could've gotten more up close with the animals of Iceland. In the summer, you can visit the Lundey and Akurey islands, right off the shores of Reykjavik, where puffins abound from April through August. We were there in September, and so had just missed them. Another thing I wish we tried was horseback riding. We’ve done trail rides with the kids on other vacations, so I didn’t book a ride here, but the furry, miniature Icelandic horses are so different-looking and adorable that afterwards I wished we could’ve gotten closer to them. We made it a point to sample the local cuisine in Iceland, and that’s how we ended up eating fermented shark, mashed white fish and Icelandic meat soup (the meat is lamb). Our favorite restaurant in Reykjavik was Icelandic Fish and Chips, where we had fresh, tender cod and pollack, perfectly fried and presented with a variety of dipping sauces, and were treated to a nice view of the harbor. We also had an Icelandic cuisine sampler at Cafe Loki, across the street from Hallgrímskirkja, which is where we tried the fermented shark. You definitely have to love seafood to enjoy traditional Icelandic fare! 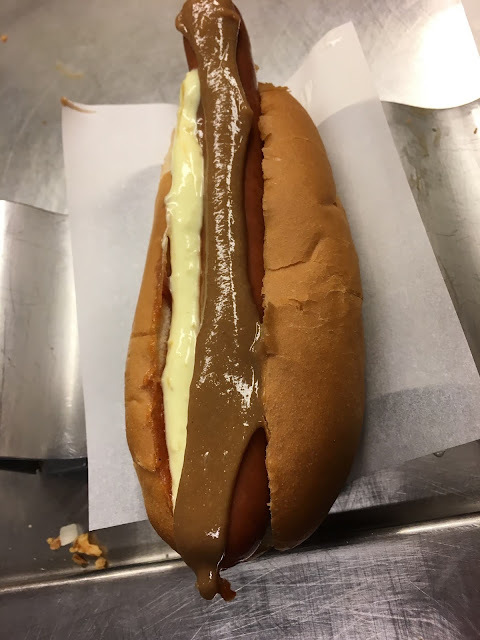 Iceland's fast food of choice is the pylsa, or hot dog, and people can be seen lining up at stands everywhere (possibly because restaurant prices are so crazy expensive!). The hot dogs have a natural casing and are made with a mixture of lamb, pork, and beef. Bæjarins Beztu Pylsur is the place with the longest line, but we ended up getting our taste from a stand around the corner of our hotel. Even though I'm not a fan of lamb, my hot dog was quite tasty and only mildly lamby. I also liked the toppings, which included a sweet brown mustard and fried onions. The bakeries in Reykjavik display their mouthwatering goods in the windows. We sampled quite a few items and found Icelandic baked goods to be fresh and slightly rustic in their composition. The cinnamon buns, for example, are deliciously soft and sweet, but not pillow-y or sticky the way American cinnamon buns can be. Somehow, they taste healthier! We went with a tour company to see the Golden Circle, a three-stop loop from Reykjavik that includes Þingvellir National Park, the Geysir geothermal area and Gullfoss waterfall. The first stop was Þingvellir National Park, known for the giant fissure that runs through the park, clearly illustrating the shifting tectonic plates of North America and Eurasia below. The park is also the site of the open-air parliament meetings that would take place annually between the early ruling chiefs of Iceland. The second stop on the tour is the most fun, the Geysir geothermal area, where you can watch an active geyser called Strokkur shoot up every few minutes. The stream is not as voluminous as Old Faithful, but it’s still plenty forceful, and the best part is that you can get close enough to the pool to watch the water start roiling just before the blast, then get sucked back into the giant hole in the ground afterwards. Strokkur delivers its blast every 5-10 minutes, sometimes twice in a row, so you can see it go off several times if you want to, minimal waiting required. The third stop at Gullfoss was perhaps the most impressive. Here, a series of powerful waterfalls are on display right up close, all gushing into the Hvítá river below. A short hike takes you along the path of the falls, bringing you up to each tier, while a permanent rainbow arches across the hiking trail. (Interestingly, the rainbow disappears as you get closer to it, then reappears when you double back on the path.) Gullfoss is not as massive as the Niagara Falls, but in my opinion it’s more grand in its dramatic presentation. We also made a couple of stops in West Iceland on our way to a snowmobiling adventure on Langjökull glacier, which included the Hraunfossar waterfall and Deildartunguhver geothermal hot springs. Hraunfossar is a completely different kind of waterfall from Gullfoss, consisting of more than a dozen smaller falls that make up a panorama. The beauty of this scene is astounding and makes you wonder how you can ever go back to being impressed by a single waterfall again! Deildartunguhver geothermal hot springs is a worthy pit stop, as it requires no more than 15 minutes to view. There's a small stream of water so hot that you can feel the heat just by being near it. I felt like I was getting a facial, standing next to the stream and breathing in the steam, but the sulfur smell can be bit difficult to get used to. The final stop on our trip out to West Iceland was Langjökull glacier, where we got to snowmobile across the glacier and visit an ice cave. Wow. There are no words to describe what it’s like to drive a snowmobile, kid in the backseat, across a swath of endless white snow and ice. You feel like you’re in a National Geographic photo, or maybe a Bond movie. Our small group of snowmobiles drove out to a man-made ice cave, where we got off our vehicles and descended into the bowels of the glacier. Various rooms have been dug out, some for scientific study, others for recreation. There's even an ice chapel there! The cave, as we learned from our guide, will only exist for a few more years, before the movement of the glacier renders the whole thing unstable and it will have to be abandoned. More caves may be dug out in the future, following the movement of the glacier, but this is pending government approval. It’s pretty amazing to be standing in a structure that you know won’t exist in a few years, and on a glacier that you know will completely disappear in the next hundred years. You really realize that Iceland’s landscape is constantly shifting and changing!